WHY IS THE CHOCOLATE OF CLAUDIO CORALLO SO UNIQUE ? - Because it is so good that it doesn't need any addition of vanilla or any other flavor. - Because our chocolate starts with the soil: we are the only chocolate makers to produce our own beans. The cacao trees are descendants from the first cacao plants to arrive in Africa in 1819. With absolute care the trees are tended in order to produce the best quality beans possible. Every step of the process is scrupulously controlled. This way Claudio transforms the cacao beans into the purest form of chocolate. 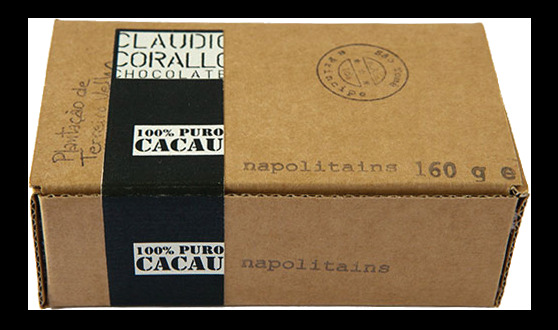 His chocolate offers the fresh and intense aromas of newly picked cacao. chocolate itself.That is not the case. Cacao is a product that is alive, that wants to be known and cared for, and that reminds you of this by making you pay for even a moment's distraction. At every different point in the refining process, the taste and intensity change in a non-linear fashion. That makes it again a risky phase where all our attention is needed. But then there is the result we have been striving for every step of the way: the100% perfection from the moment the cacao is picked off the tree until it reaches you. Living for over 35 years in a plantation, we have learnt to make the most of our resources. Claudio loathes waste. This philosophy you find back in our packaging. It is simple, it should not distract from the quality of the product. It is meant to protect the product and at the same time respect the environment.